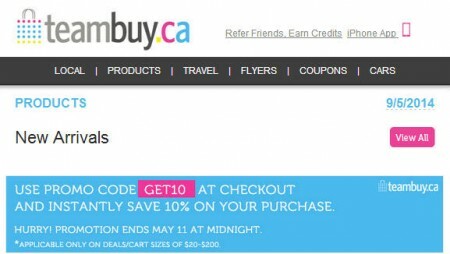 You can save an extra 10% off your purchase on TeamBuy.ca this weekend when you enter the promo code GET10 at checkout! The 2-day promo code expires at midnight on Sunday, May 11, 2014. The code is applicable only to cart sizes between $20 – $200. Only a limited amount of people can use the code so take advantage of the offer while you still can! To maximize your savings, you can add as many different deals on TeamBuy as you want to the shopping cart. The promo code will instantly deduct 10% off your entire purchase. This is a hot deal because TeamBuy rarely offers promo codes and most of their deals is already discounted 50-95% off! You’ll find some amazing deals with the extra 10% off. TeamBuy is one of my favourite daily deals sites. I think they consistently feature some of the best deals. I’ve bought a lot of deals on TeamBuy over the last couple years and I highly recommend them. Click here to view all of TeamBuy.ca current deals.